For the cinnamon truffles, place the chocolate in a bowl. Heat the cream with the cinnamon sticks on medium-low heat for 5 minutes, to infuse the cinnamon flavour into the cream. Remove the cinnamon sticks and pour the heated cream over the chocolate and let it sit one minute. Stir gently until the chocolate has melted, then chill until set, at least 2 hours. For the cupcakes, preheat the oven to 325 F and line 24 muffin cups with large paper liners. Sift the flour, sugar, cocoa, baking powder, cinnamon, 5-spice, baking soda and salt together. Using a stand mixer fitted with the paddle attachment or using electric beaters, blend the flour mixture for just a few seconds to fully combine. In a separate bowl, lightly whisk the eggs, then add the milk, coffee, oil and vanilla (the oil will float to the top). Add this all at once to the flour mixture and blend first on low speed, then increase to medium speed and beat for 2 minutes. The batter will be very wet. Ladle or pour the batter into the cupcake cups, filling to about ¾ full. Bake for about 25 minutes, until a tester inserted in the centre of a cupcake comes out clean. Cool the cupcakes in their tins for 10 minutes, then remove to cool on a rack. To insert the truffle, use a melon baller to scoop out a circle of cake from the top of each cupcake. Use the same melon baller, dipped in a little warm water to scoop our truffles of the same size, and gently press a truffle into each cupcake. For the frosting, beat the cream cheese and butter until smooth and fluffy. Add the icing sugar and vanilla and beat first on low speed then on high, until the frosting is light and fluffy. Remove half of the frosting to a bowl and set aside. Beat in the melted chocolate into the remaining frosting. Prepare a large piping bag with a large star tip. Spoon the vanilla frosting carefully down one side of the piping bag, and then spoon the chocolate frosting down the opposite side. 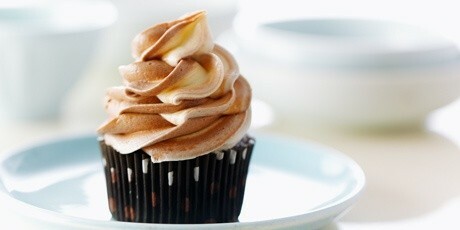 Squeeze out a little frosting to start the “swirl” effect, then pipe spiral twists of frosting on to of each cupcake. Chill the cupcakes for at least an hour before serving. 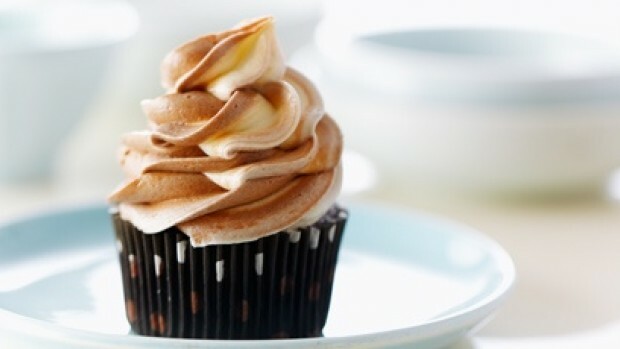 The cupcakes are best served chilled and will keep refrigerated for up to 3 days.